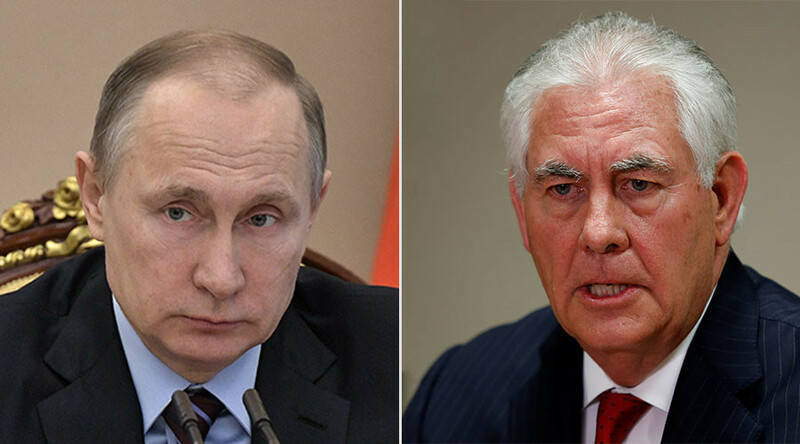 Despite speculations to the contrary, US Secretary of State Rex Tillerson has met Russian President Vladimir Putin in Moscow. Some observers claimed this wouldn’t happen due to the tension between the two nations. “Russian President Vladimir Putin is meeting US Secretary of State Tillerson and Russian Foreign Minister Lavrov at the Kremlin,” presidential spokesman Dmitry Peskov said on Wednesday evening. US emb. press service: #Tillerson - #Putin talks lasted for about 1 hour 50 minutes. Peskov did not elaborate on what the three discussed. Earlier in the day, Tillerson held a meeting with Sergey Lavrov. The top US diplomat is visiting Moscow amid a conflict over the alleged use of chemical weapons in Syria. The US blamed the incident, which happened almost two weeks ago, on Damascus, and retaliated with a barrage of cruise missiles targeting a Syrian airbase. Russia called it a possible false flag operation and said the US attack was an act of international aggression. It also said more provocative incidents involving toxic agents may follow in Syria, now that the Trump administration has demonstrated it can be baited into the reaction that the enemies of Damascus want from it. Moscow believes a proper investigation, including at the scene of the reported attack, is necessary to establish the truth. While this is their first official diplomatic meeting, Putin and Tillerson have a professional relationship going back to 1999, when Putin was appointed Prime Minister ahead of his first presidential term. The two met over a proposed joint oil project on Russia’s island of Sakhalin, which Tillerson went on to head, before rising to become President of ExxonMobil. Over the past decade, the two have signed multiple oil development deals, and in 2013 the US executive was personally awarded an Order of Friendship medal by the Russian leader.